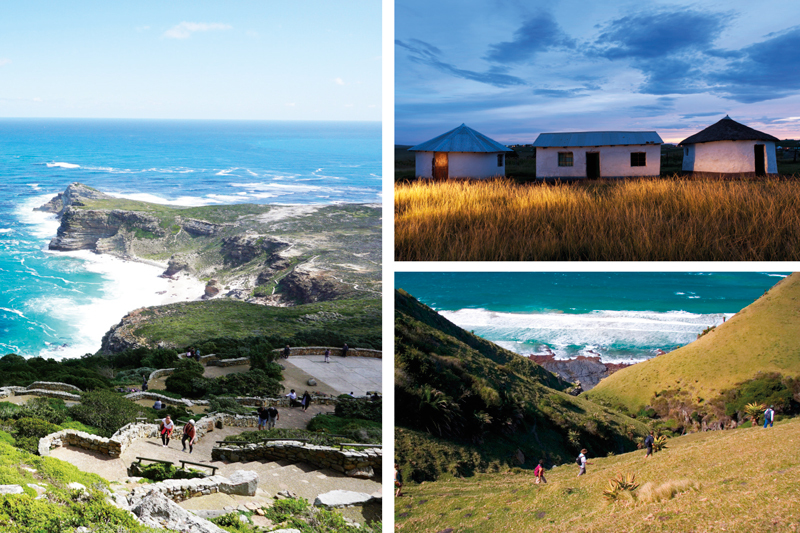 In terms of effort versus reward, this five-day, 55 km self-catering trail meandering through De Hoop Nature Reserve is easily the most spectacular multi-day hike the Western Cape has to offer. The trail begins by heading inland, through pristine fynbos and up to the summit of the Potberg. This corner of De Hoop is home to a colony of endangered Cape vultures, so keep one eye on the path and one on the skies. From Potberg the path leads downhill, heading for the coast and arguably the most spectacular section of the walk. For the next three days, the trail leads along deserted beaches and rocky cliffs, delivering unbeatable views out over the Indian Ocean. The waters offshore were declared a Marine Protected Area more than 30 years ago, so the sea life is impressive. In season (July to November) you’ll be treated to sightings of dozens of southern right whales, which migrate here from Antarctica to breed and calve. You absolutely must remember to pack a mask and snorkel too – for exploring the pristine rock pools along the way. More good news? The Whale Trail is a slackpacking trail, so your bags are transported between the overnight huts, meaning you can stash a few luxuries and you’ll only have to carry a daypack with lunch, water and a warm jacket in case the weather turns. However, the trail has become so popular that you’ll need to book months in advance, particularly if you’d like to visit during the peak whale season. But even if the whales have headed back down south, the Whale Trail remains one of South Africa’s most incredible walks. In South Africa, hikers refer to ‘The Otter’ in hushed tones. It is easily the most lauded and respected multi-day hiking trail the country has to offer. The 42.5 km path runs along the coastline of the Garden Route National Park, from Storms River Rest Camp to Nature’s Valley. It’s a five-day walk, best for those with strong legs and a stout spirit. You’ll need to be self-sufficient, carrying all food, equipment and clothes. The strenuous trail dives down steep cliffs only to climb craggy headlands, but the rewards are spectacular, with overnight huts situated dramatically along the coastline. Bookings should be made up to a year in advance. Most visitors to the Cape Point section of Table Mountain National Park drive straight down to the Point, take their photos, and drive out again. Sure, you will enjoy panoramic views over the Atlantic Ocean, but you’ll also miss out on the quiet, windswept charm of this remarkable reserve. Exploring on foot, it’s easy to see why, when sailing past in 1580, Sir Francis Drake called this ‘The Fairest Cape in all the World’. 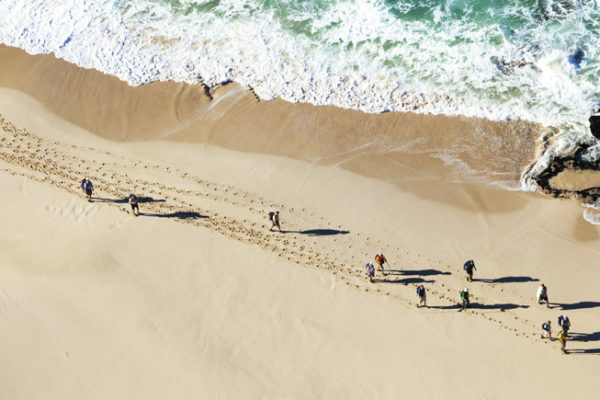 The Cape Point section offers wonderful walking trails, from the short Lighthouse Keeper’s Trail, which runs down to the new clifftop lighthouse, to the Cape of Good Hope Trail, which promises vertiginous views down to the idyllic Diaz Beach. If you have a little more time, the Antoniesgat Trail is a fantastic way to explore Buffelsbaai, a corner of the Park rarely visited by tour groups. The trail offers superb views out over False Bay, with easy access to tidal pools for a quick dip. There are braai areas at Buffelsbaai too, but do watch out for the local troop of baboons, which may try to invite themselves for lunch. Across on the western side of the peninsula, the Shipwreck Trails show just how treacherous waters off the Cape can be, with rusted iron hulls littering the shoreline. The most famous of these, and the most accessible on foot, is that of the SS Thomas T Tucker. The ship was wrecked here in 1942 after the captain sailed close – too close, as it turns out – to the shore in a bid to avoid German U-boats. Further on you’ll find the remains of the Nolloth, wrecked in 1965, before the path turns inland to track an easy course back to the parking area at Olifantsbos. 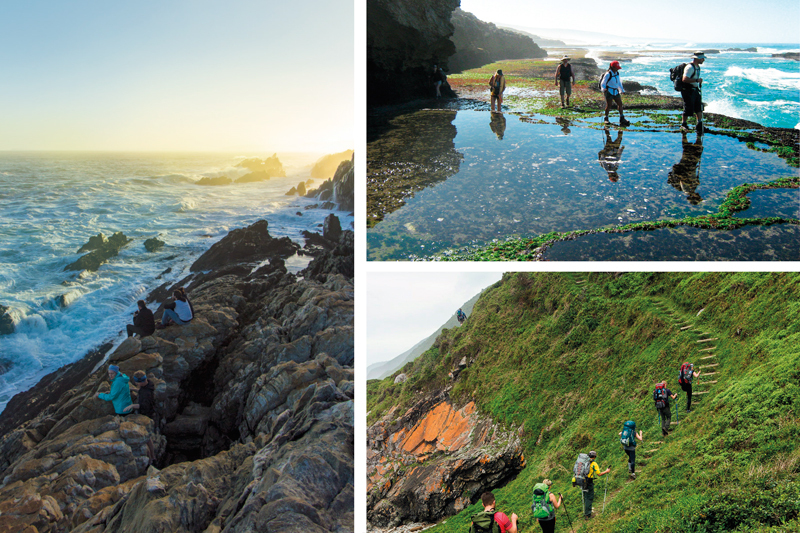 For a combination of local culture and coastal scenery, don’t miss out on the multi-day slackpacking trails that snake along the Wild Coast, usually a five-night route stretching south from Kob Inn at the Qora River Mouth to Cintsa. Along the way, hikers discover rural villages and untouched beaches, marvelling at the tales told by local guides. Bags are portaged each day, and accommodation is typically in the charming family-run hotels that dot the coves and bays along these shores, offering warm hospitality and a slap-up dinner to steel you for the next day’s walking. The local Zulus dubbed it uKhahlamba, the ‘barrier of spears’. Later it became known as the Drakensberg, the outline of jagged peaks resembling the scaly spine of a dragon. Whichever name you prefer, this World Heritage Site offers dozens of unforgettable walks and trails. Rainbow Gorge is an easy wander into a lush valley just beyond Cathedral Peak Hotel, while the guided walk to Battle Cave is the finest of the many trails leaving Injisuthi Camp in the central Drakensberg. But, the most famous walk is the full-day trail to the summit of the Amphitheatre, a five-kilometre crescent of rock that falls 1 200 m to the valley floor. It’s a straightforward path, but you’ll need a good head for heights to tackle the (in)famous chain ladders to the summit. Proclaimed in 1895, the Hluhluwe-iMfolozi Park in northern KwaZulu-Natal is one of Africa’s oldest game reserves. While self-drive visitors are welcome, the best way to explore this remarkable conservation area is on foot, and the iMfolozi Wilderness Trails are an ideal way to get up close and personal with the fauna and flora of the region. Trails range in length from two to four nights. 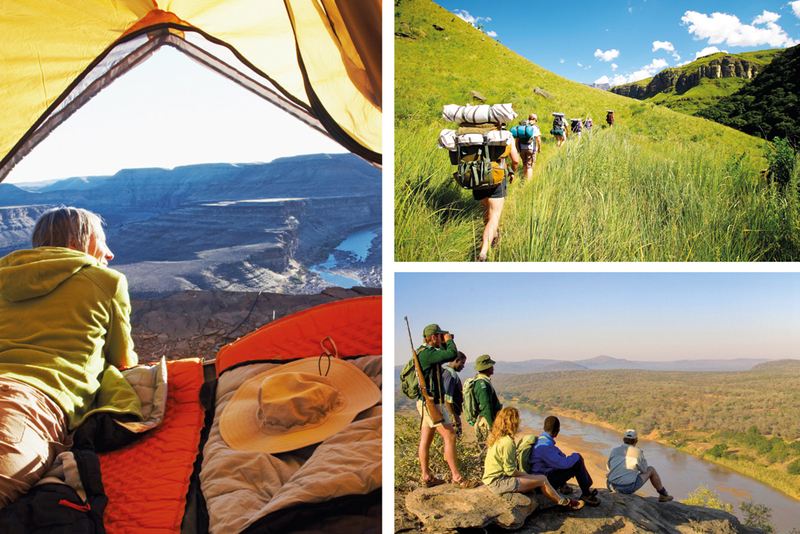 The five-day Primitive Trail is for the hardy outdoor enthusiast; you’ll be camping wild in the bush and sleeping under the stars. The Explorer Trail is an easier option, with two nights at Mdindini Base Camp and two nights spent out in the wilderness. Worried about the wildlife? An experienced Trails Officer and Field Guide accompany you every step of the way. All equipment and food is provided for the duration of the trail. The multi-day trail in the belly of Namibia’s Fish River Canyon is, like the Otter Trail, a serious walk for serious hikers. The hike begins at the viewing site near Hobas campsite, with hikers eventually reaching Ai-Ais Resort some five days and 85 km later. Though the trail is long, the scenery is remarkable, with the route making its way through the world’s second-largest canyon. However, it’s a tough trail that requires fitness and experience. There is no support en route, so you’ll need to carry everything from food to shelter, and there are few emergency exits in case of injury.